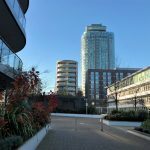 Brentford based Vokins Chartered Surveyors have acquired Floor 25 at the top of Kew Eye Tower, Great West Quarter, Brentford, from Barratt London. The floor, known as The Viewing Gallery because of its 360 degree panoramic view, will be re-named The Summit Suite. The building is one of the tallest in West London, and was designed in 2014 by Assael. Vokins plans to move its headquarters to The Summit Suite, and has appointed Renata Sa of SA Design to review and design the layout of the space. The Summit Suite will be designed to provide for pre-booked education, seminars, corporate educational events and meetings etc, whilst allowing Vokins to operate its business from the floor. Vokins is a family run business now in its 25th year of operation within London Borough of Hounslow.